Skull (posterior view) - Visual Dictionary - Copyright © 2005-2016 - All rights reserved. [img]https://infovisual.info//storage/app/media/03/img_en/016-skull-posterior-view.jpg[/img] [url=https://infovisual.info/en][/url] - [url=http://www.infovisual.info/]Visual Dictionary[/url] - Copyright © 2005-2016 - All rights reserved. Skull (posterior view): bony case of the brain of vertebrates. Parietal foramen: cavities of the parietal bone near the sagittal suture. Sagittal suture: seam joining the two parietal bones. External occipital protuberance: bump on the external surface of the occipital bone. Mandible: bony lower part of the jaw. Mastoid process: bony outgrowth of the base of the skull. External occipital crest: serrated outgrowth of the occipital bone, crossing it from top to bottom. Occipital: bone forming the lower back part of the skull. Lambdoid suture: seam between the occipital bone and the parietals. 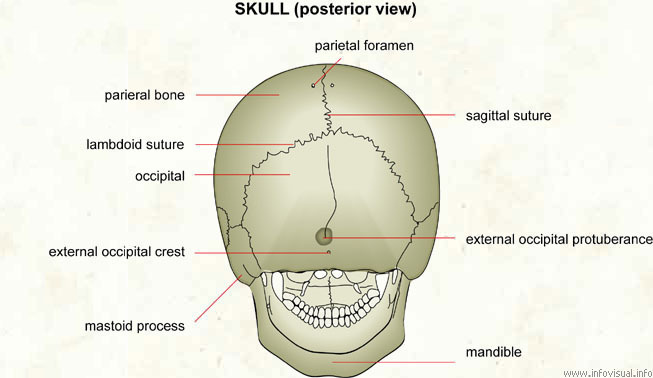 Parietal bone: bones forming the sides and top of the skull.